A new Portland State University study shows that even though water quality has improved in South Korea's Han River basin since the 1990s, there are still higher-than-acceptable levels of pollutants in some of the more urbanized regions in and around the capital Seoul. The study by Heejun Chang, a geography professor in PSU's College of Liberal Arts and Sciences, and Janardan Mainali, a Ph.D. student in geography, was published online in the Journal of Hydrology in June. It was supported by a grant from the National Science Foundation. The study used spatial data from the early 1990s through 2016 to examine seasonal water-quality trends in the Han River basin, the largest and most populous river basin in South Korea. The river had become synonymous with pollution as factories, farms and city sewer systems poured waste into its waters. But ahead of the 1988 Seoul Olympics, the government launched efforts to begin cleaning it up. The study examined the relationship between water quality—as measured by total nitrogen (TN), total phosphorus (TP), chemical oxygen demand (COD) and suspended soil particles—and topography, population density, soils, and land cover such as changes from forest or agricultural use to urban land. 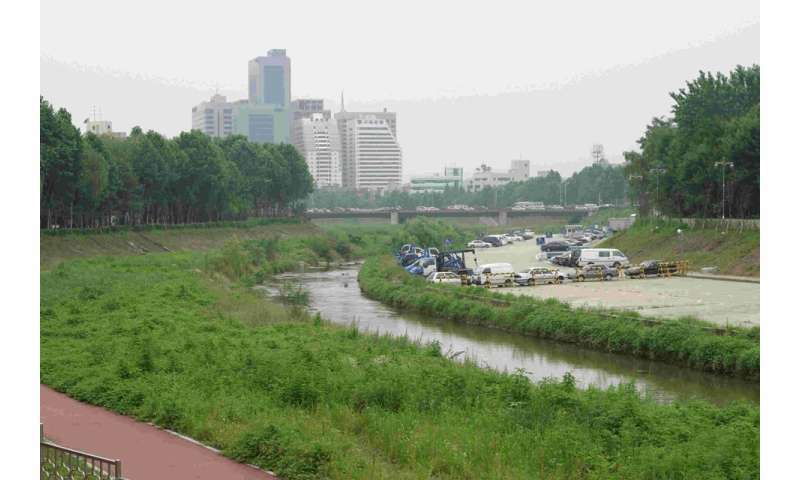 The study showed that the water quality generally improved within the Seoul metropolitan area but declined in rural areas from the early 1990s to 2016. Some of the urbanized regions still had higher-than-acceptable concentrations of nitrogen, phosphorus and COD. Even though wastewater treatment plants were built, the study suggests that the population growth in suburban areas may have outpaced the proper treatment of wastewater as well as increasing runoff or "non-point source" pollution. Chang, who also serves as a faculty fellow at PSU's Institute for Sustainable Solutions, said that governments and agencies need to be proactive in ensuring water quality is a priority, particularly in suburban and developing rural areas, by imposing more stringent regulations, implementing best management practices and creating natural buffers. "Nature-based solutions have shown to improve water quality in the long run," he said.